Keep certain types of ads off your site by opting out of sensitive categories from our biggest ad partner. We get it. Sometimes there are ads that you just don't want to see. And sometimes there are categories that are a great fit for one site, but not for another. At Mediavine we give you plenty of tools to tailor ads to your audience. You can report ads via Pubnation, but we also have a tool available to you right in your Mediavine dashboard. Our largest partner, Google, allows each publisher to opt out of sensitive categories on a per site basis. The Opt Out tab in your dashboard is directly connected to your site's preferences in Google's AdExchange. It's important to note that Google is the only partner that currently lets us filter categories in this way, so we have opted out of them with every other partner by default. 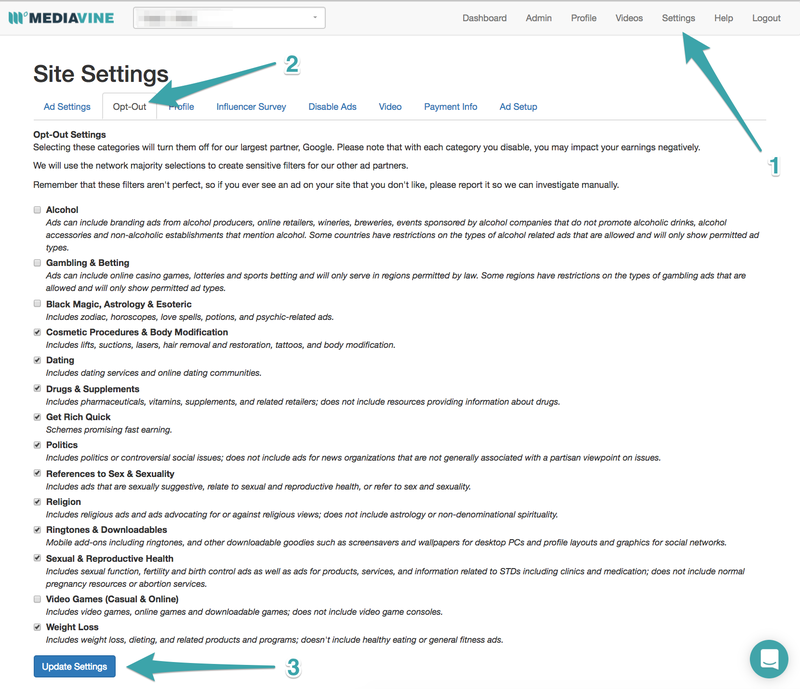 To choose which categories you'd like to opt out of on your site, first head to your Mediavine dashboard. 2. Click the Opt Out tab. 3. Click Update Settings. Now you're all set! Remember that these filters aren't perfect, so if you ever see an ad on your site that you don't like, please report it so we can investigate manually. Learn more about reporting ads. Please note that with each category you disable, you may impact your earnings.